Klip Gallery: Searchmetrics – How can we help you today? Searchmetrics is a search engine optimization tool. It takes a data driven approach using search and content optimization marketing. Leverage the winning keywords for your website and increase your search traffic. Discover last month's estimated paid value of organic search traffic in USD. Discover social visibility for the top 10 URLs associated with your domain name. Compare the social visibility of your URL to your competitors. Monitor the estimated value of your search traffic and compare it to the previous month. Compare your domain's homepage links and deeplinks on a pie chart. Compare this week's SEO visibility to the previous week and discover the trend. Discover the number of organic keywords linked to a domain name and country code, and compare it to the previous month. Stay on top of the game and compare your SEO visibility to your competitors. Compare Organic searches of your domain in comparison with searches of your competitor's domains. Select an Searchmetrics Klip from the Gallery. In the Connect to Services dialog box, you are asked for your Searchmetrics API Key and Secret. To find your Searchmetrics API Key and API Secret, login to your Searchmetrics account. 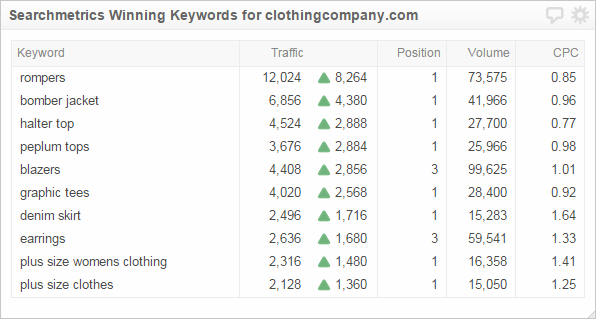 In Searchmetrics, select the Settings dropdown menu. Copy your API Key and API Secret and paste it into Klipfolio. In the Data source settings dialog box, enter your domain or subomain and (depending on the Klip), and competitor domain name(s). Depending on your Klip, choose a Country Code. This allows you to see your domain rankings in a certain country.